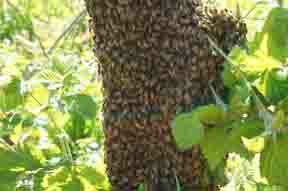 It’s been a little crazy at the backyard apiary, to say the least. 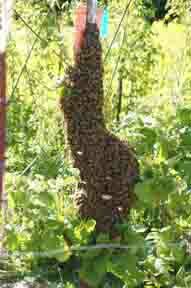 At the end of our last blogpost, we had a swarm of bees on a small cedar. 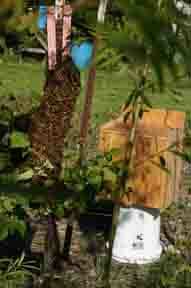 We provided them options: a swarm “trap” (aka “bait box”) scented with lemongrass oil up in a nearby tree OR an empty hive, complete with the scent of “home” from the previous residents and an indoor supply of sugar syrup to get them started. I was so proud of myself for “letting them be bees.” Rather than directly interfering with their decision, I was encouraging them to make the choice that would be most convenient for me (and hopefully, best for them). Look! They moved in! And they are fanning at the entrance & announcing their new home! I sat out there all morning, hoping to catch a picture of when they moved. But finally, I said, “Shoot. I’ve got things to do today,” and of course, it was right after that that they took flight. Wrapped around a steel fencepost! Not something you can just cut and drop in a bucket! Let’s look at these little guys up close. Whoaaa! That’s a LOT of bees! I thought everything was GREAT, but then, lo and behold, as I walked out to the garden the next morning, the air was electric with the sound of buzzing bees! They were everywhere! Yikes! Another Swarm! Or was it part of the same swarm? An afterswarm? – Whatever! There was a growing bundle of bees in the blackberry bushes, concentrating on a loganberry branch. Hmmm. This would have been relatively easy to cut had it not been leaning up against a steel fencepost, around which a very large number of bees were tightly wrapped. There would be no easy way to get them off the fencepost, and the question was what to do? Do I brush them off? Wait and see where they go? Do I risk losing all these bees? We had things to do today, and these guys were definitely putting a kink in the plans! I scrambled to set up a place for a new hive (call this Hive #4 – we now had a row of hives on the north side of the property, facing south, labeled left-to-right in order of acquisition: Hive 3 (yesterday’s swarm), Hive 1 (last year’s swarm; our oldest residents), Hive 4 (our new hive, waiting for occupancy), and Hive 2 (this year’s purchased Carniolans). We have options here. Sort of. A swarm box, a bucket, and the wide open air. 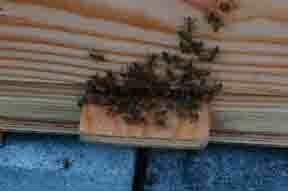 I set up a swarm trap on the ground near the swarm. No one was very interested. I decided to speed up this process a bit and try to drop what I could into a bucket, which I could then dump into the empty hive, much like I did with the packaged bees (Is there a disconnect here? Do we remember how the bees all took flight instead of “dumping” into the hive?). So I cut the loganberry branch, but the fence was kind of in the way, and instead of dropping into the bucket, they dropped on the ground. Yikes! What a calamity! There were a few in the bucket, some on the ground, a large bunch still clinging to the fencepost, and a great majority in the air. I stood in the middle with sweat dripping into my nitrile gloves. Did I mention the steep learning curve here? The location of the queen was anybody’s guess. Ok – since I was now indeed forcing the issue in a very big way, there was no point in delaying. I thought my hawk feather would normally have been better to use, but to get around the post, we used a very soft-bristled brush instead. I call it the Weapon of Mass Disruption. There was no gentle way to get them off the fencepost; it required a definitive, brisk, swoop to make them land in a clump in the bucket. Swoosh. And again. Swoosh. Swoosh. Swoosh. A whole bunch just took off into the air. It was just getting worse and worse. Lots of activity at the entrance of the new hive. Hoping they stay! Everything appeared ok, I had tried my best to minimize injuries, but I was not sure I had captured the queen. 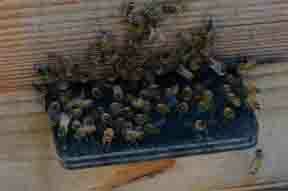 Bees were indeed going in and out of the hive, and there was a large number clustered on the landing board. Would they stay??? All we could do was wait and see…..